Olivia Hunt Horn, daughter of Ocie Lee Hunt and Nellie Catherine Irvin, married to Bill Floyd Horn and buried in Bradshaw Cemetery, Bradshaw, Taylor Co., Texas. Olivia Hunt Horn of Lubbock, 84, died November 6, 2010 in the company of loved ones. A memorial service celebrating her life will be held Wednesday, November 10 at 2 p.m. at St. John's United Methodist Church, 1501 University Ave, Lubbock. Olivia was born Dec. 2, 1925 in the ranching community of Ballinger, Texas, the only child of Ocie Lee Hunt and Nellie Catherine Irvin Hunt. 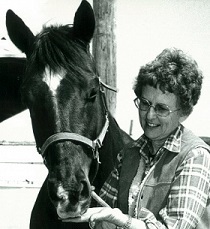 Her lifelong love for animals, and especially horses, started early. She began riding horses at the age of three, sitting in the saddle behind her uncle on the ranch gelding. Soon she was driving her own little white donkey in a painted donkey cart. The stories of her small town childhood seemed magical and enchanting to children growing up in the city. She graduated from McMurry College with a degree in piano performance. She met and married Bill Horn in Abilene, Texas. Soon after that they made their home together in Lubbock, where Olivia dedicated herself to her beloved family as a homemaker and mother for the first half of her adult life. Olivia was not the typical 1950s mother, and her daughters' friends remember her for her liberal politics and her marvelous ability to find life both interesting and very funny. Good advice was available on request, but she did not push. She provided endless support and innumerable trips to the stables where Cathy kept her horse. She served many years as Mindy's Bluebird and Camp Fire leader inspiring them to learn unladylike skills such as camping, international folk dance and lumi sticks. After Bill's death Olivia went back to school and received her library certification at West Texas State University at Canyon in 1978. She began her second career as Head Librarian for New Deal Independent School District. Students remembered her fondly for many years after her retirement. Olivia loved life and approached it with an infectious joy. An avid reader, she embraced all types of books but was particularly fond of Georgette Heyer. She was a wonderful friend and kept up an active correspondence with friends who were far away. She enjoyed music and delighted in going to the symphony when she could. Olivia rode horseback well into her later years and even threatened to take up riding again while she was on chemotherapy to the horror of her oncologist. She hosted three international students from China, Bolivia and India who shared her home and became family to her. Olivia retired to Lubbock where she continued reading, taking care of her numerous cats and dogs, including her favorite black lab, Susie. She belonged to an ongoing Discussion Group that met twice monthly for 50 years for dialogue and conversation. Her memory will be cherished by the Discussion Group she loved for so long. Her friends loved her spirit, her feistiness, and her devotion to learning. She made them laugh a lot, and she will be greatly missed. She is survived by two daughters, Catherine Forbes of Arlington, Texas and Melinda Brent of San Antonio. The family suggests that donations go to Hospice of Lubbock, South Plains Wildlife Rehabilitation Center, and St. Johns United Methodist Church.